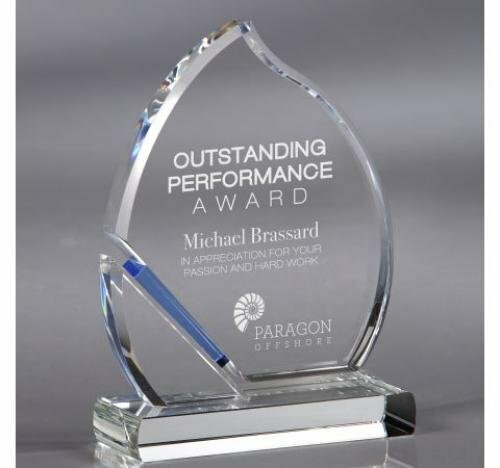 Radiating with prismatic reflections from the prominent facets and hint of blue, this spectacular optical crystal presentation is truly elegant — a recognition award honorees will be proud to receive and display. Award comes in three sizes. 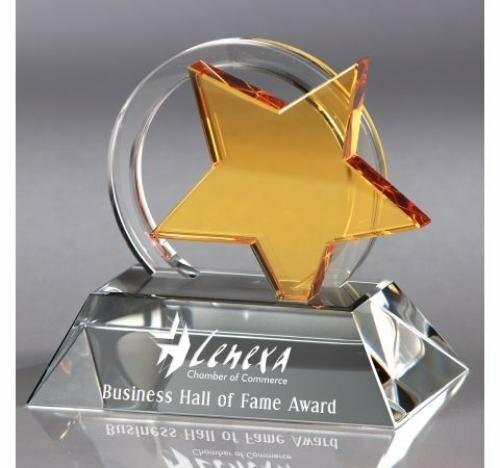 Small - 8 1/2" x 3 1/4" x 3"
Medium - 10 1/2" x 4" x 3 1/2"
Large - 13" x 5" x 4"
Bursting with a rainbow of color and chrome-like interior reflections, the prominence of this striking optic crystal award will mirror the star-like performance of its recipients. Award comes in three sizes. Small - 7 1/4" x 3 3/4" x 1 3/4"
Medium - 8 1/4" x 4 1/4" x 1 3/4"
Large - 9 3/4" x 4 3/4" x 1 3/4"
A shining brightness like a bright flame of fire or a glistening drop of water, this carefully crafted optical crystal award, with a tinge of radiating blue, is sure to reflect the passion and pride of achievement of its honored recipients—perfect for one who has blazed a trail or conquered the rapids! Award comes in three sizes. Small - 6 3/4" x 4 3/4" x 2"
Medium - 7 3/4" x 5 1/2" x 2"
Large - 8 3/4" x 6 1/2" x 2"
Diamante, Italian for diamond, features a striking optical crystal diamond-like design elevated between beveled pillars and supported with a black crystal base. Ideal for recognizing top achievement. 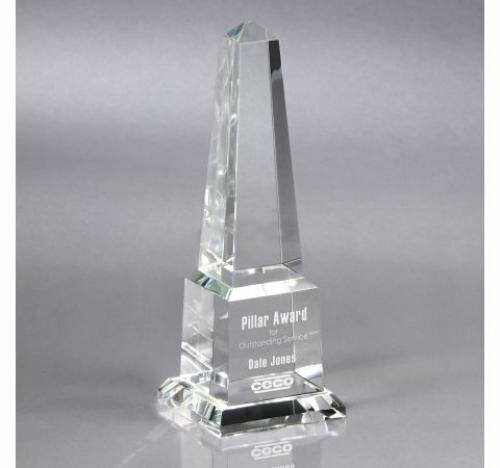 6 1/4" x 9" x 3 1/4"
When you have a lot to say, the Fanfare optical crystal award is the trophy of choice! 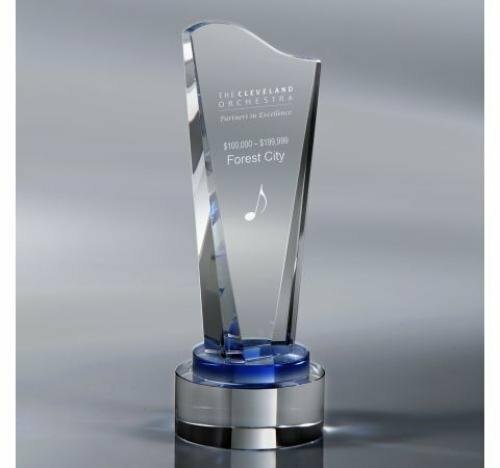 Heavily beveled clear and sparkling blue with a stately base, the Fanfare proclaims the feats of the recognized. Trumpeting the milestone achieved or the success realized, the Impact Globe is one of our most spectacular awards. 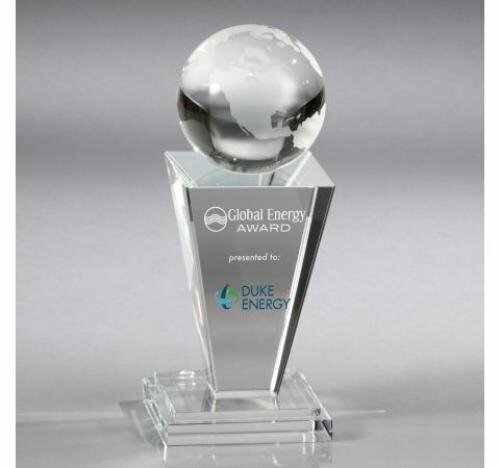 Its trapezoid tower appears to shoot upward from its stair step platform with the dramatic impact of the award culminating with the crystal globe secure atop the tower. This grand award is an award of far reaching admiration. Award comes in three sizes. Small - 8 1/2" x 3 1/5" x 3 1/5"
Medium - 10" x 4" x 4"
Large - 12" x 4 1/2" x 4 1/2"
Every organization has individuals and teams who are essential to its success. The Keystone design reflects that truth and is a beautiful way to recognize all those who make a difference. 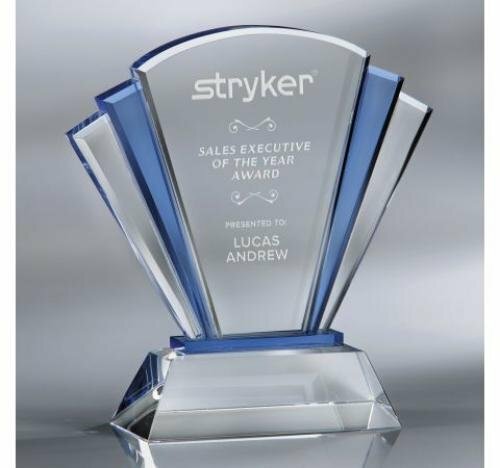 This glistening optical crystal award, with hand cut bevels and popular blue highlights, features a large keystone-shaped crystal canvas to declare your recipient’s high achievement. Award comes in three sizes. Small - 7" x 5 1/4" x 1 3/4"
Medium - 8 1/2" x 5 3/4" x 2"
Large - 10" x 6 1/2" x 2 1/4"
The star has long been used to recognize those who rise above in excellence. The Nova is a fascinating design with the golden amber crystal star cleverly positioned, as if moving, in front of the symbolic rising circle—both emerging from the grand optical crystal base. 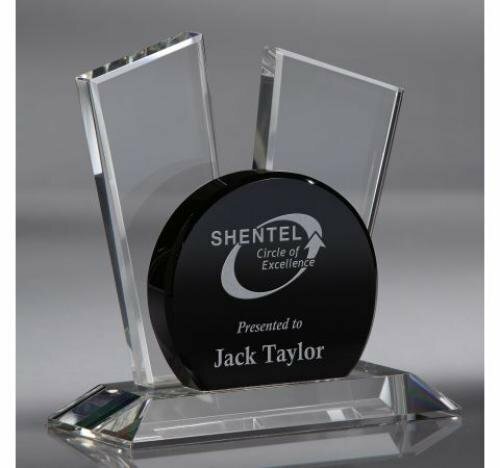 This extraordinary star award is for your extraordinary achievers! 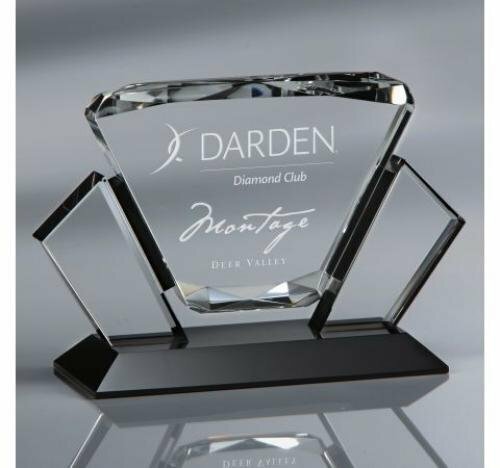 5 1/4" x 6 1/4" x 3 3/4"
Featuring a bold black crystal landscape to trumpet the success realized, the Ovation is sure to win the applause of those who receive it. The two beveled optical crystal panes are aslant and non-symmetrical giving the impression of a crescendo of praise! 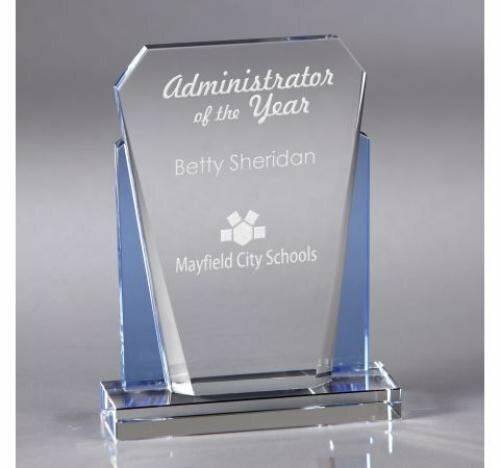 7.5" x 7" x 3 1/2"
There is no better way to mark the culmination of success and achievement than with the majestic Pinnacle award. 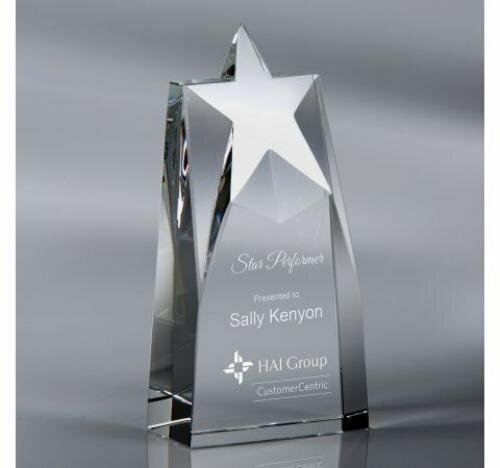 Striking reflections abound in this optical crystal award—impressive to match the accomplishments! Award comes in three sizes. Small - 9" x 3 1/4" x 3 1/4"
Medium - 10 3/4" x 3 3/4" x 3 3/4"
Large - 12 3/4" x 4 1/4" x 4 1/4"